June 6, 2016 – NASA astronaut Jeff Williams opened the hatch to the Bigelow Expandable Activity Module (BEAM) at 2:47 a.m. MDT Monday, June 6. 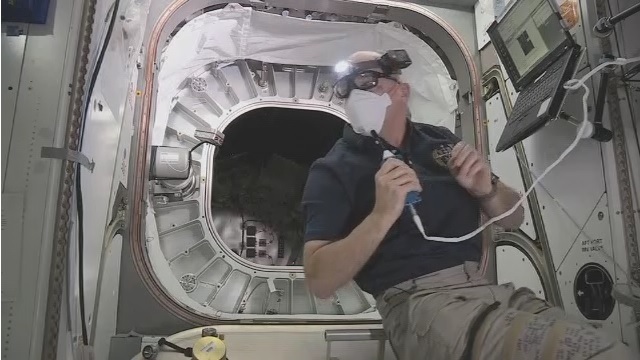 Along with Russian cosmonaut Oleg Skripochka, Williams entered BEAM for the first time to collect an air sample and begin downloading data from sensors on the dynamics of BEAM’s expansion. Williams told flight controllers at Mission Control, Houston that BEAM looked “pristine” and said it was cold inside, but that there was no evidence of any condensation on its inner surfaces. Additional ingress opportunities to deploy other sensors and equipment in BEAM are scheduled for Tuesday and Wednesday. The hatch to BEAM will be closed after each entry. The Bigelow Expandable Activity Module (BEAM), the first human-rated expandable module deployed in space, is a technology demonstration to investigate the potential challenges and benefits of expandable habitats for deep space exploration and commercial low-Earth orbit applications. Williams and the NASA and Bigelow Aerospace teams working at Mission Control Center at NASA’s Johnson Space Center in Houston expanded the Bigelow Expandable Activity Module (BEAM) by filling it with air during more than seven hours of operations Saturday, May 28. The BEAM launched April 8 aboard a SpaceX Dragon cargo spacecraft from Cape Canaveral Air Force Station in Florida, and was attached to the International Space Station’s Tranquility module about a week later. Williams’ entry marks the beginning of a two-year data collection process. He will take an air sample, place caps on the now closed ascent vent valves, install ducting to assist in BEAM’s air circulation, retrieve deployment data sensors and manually open the tanks used for pressurization to ensure all of the air has been released. He will then install sensors over the following two days that will be used for the project’s primary task of gathering data on how an expandable habitat performs in the thermal environment of space, and how it reacts to radiation, micrometeoroids, and orbital debris. During BEAM’s test period, the module typically will be closed off to the rest of the space station. Astronauts will enter the module three to four times each year to collect temperature, pressure and radiation data, and to assess its structural condition. After two years of monitoring, the current plan is to jettison the BEAM from the space station to burn up on re-entry into Earth’s atmosphere. Expandable habitats are designed to take up less room when being launched but provide greater volume for living and working in space once expanded. This first test of an expandable module will allow investigators to gauge how well the habitat performs and specifically, how well it protects against solar radiation, space debris and the temperature extremes of space. The BEAM is an example of NASA’s increased commitment to partnering with industry to enable the growth of the commercial use of space. The BEAM, which Bigelow Aerospace developed and built, is co-sponsored by Bigelow and NASA’s Advanced Exploration Systems Division. The expansion process already has provided numerous lessons learned on how soft goods interact during the dynamic event of expansion. The module measured just over 7 feet long and just under 7.75 feet in diameter in its packed configuration. BEAM now measures more than 13 feet long and about 10.5 feet in diameter to create 565 cubic feet of habitable volume. It weighs approximately 3,000 pounds.